New courses, more faculty and important twists on the current curriculum are some of the changes in store for College of Humanities and Social Sciences (CHSS) students when classes begin Monday, Aug. 29. A Bachelor’s of Science degree in Sociology with an Emphasis in Social Work. Dr. Sherman Elliott, College of Humanities and Social Sciences dean, is excited about the new school year. The social work degree is attracting a surprising number of enrollees, said Dr. Sherman Elliott, CHSS dean. More than 53 ground students and more than 150 online students had enrolled in the program by early August. Elliott also is hoping for high enrollment in the new degree programs, a Bachelor of Arts in English with a Professional Writing Emphasis and a Minor in Professional Writing. 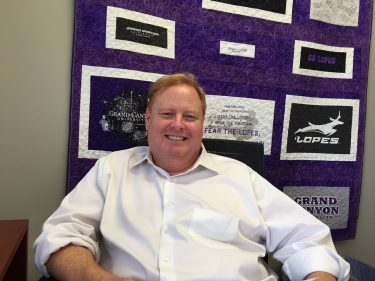 These degrees are designed to attract not only communications and English students but any student at GCU, Elliott said. Elliott said he is “extremely proud” of Justice Studies faculty members Kevin Walling and Colonel Stemley for their wholesale revision of the program to reflect the evolving needs of society and its relationship to police. “The program shifts the nature of policing, focusing on community policing and handling unique populations, such as the mentally ill and minorities,” Elliott said. The program is a move away from the enforcement/firepower model of policing. Also new to CHSS this fall are six new faculty members, three who will teach mathematics and one each to teach English, sociology and communications. Three are former GCU adjuncts, which reflects Elliott’s preference to promote from within. Contact Laurie Merrill at (602) 639-6511 or laurie.merrill@gcu.edu.